Apple's new iPad mini with Retina display will debut in November for $399, while the first-generation iPad mini will live on with a new, lower entry level price of $299. 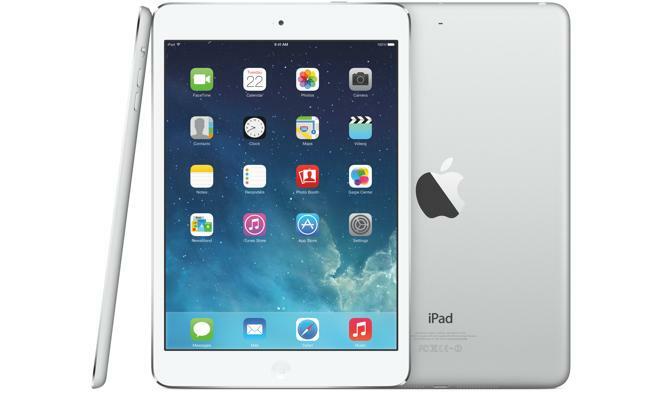 The new iPad mini packs in just as many pixels —3.1 million —as the Retina display on the full-size iPad Air. That means the iPad mini actually has a higher pixel density on its display than its larger brethren, at 326 pixels per inch. It's also powered by the same A7 chip as the iPhone 5s and iPad Air. It's up to 4 times faster at CPU tasks than the first-generation iPad mini, and up to 8 times faster at graphics tasks, all while still offering 10 hours of battery life. Apple has boasted that the 7.9-inch Retina display on the iPad mini offers a 35 percent larger area than screens with 7-inch tablets. 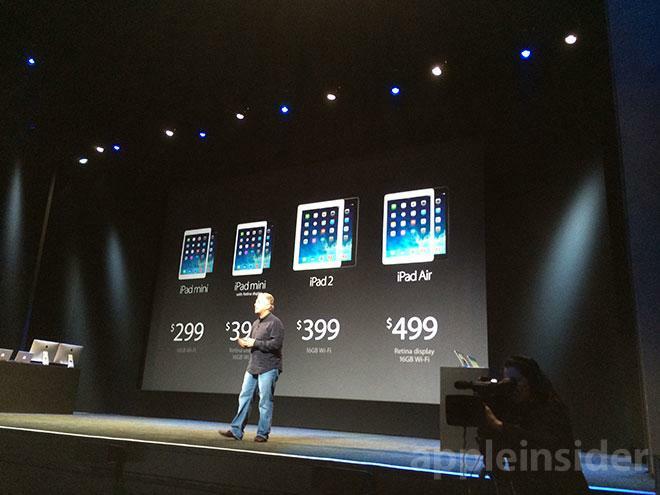 It's also the only small tablet to deliver Apple's full iOS ecosystem and App Store. The new iPad mini can play movies at full 1080p high-definition resolution, and there are now 475,000 applications designed specifically for the iPad. The new Retina iPad mini features two antennas to support Multiple-In-Multiple-Out (MIMO) technology, bringing twice the Wi-Fi performance at 300Mbps. Cellular models also come with expanded LTE coverage to accommodate even more LTE networks worldwide, while continuing to deliver comprehensive support for other fast cellular technology around the world (DC-HSDPA, HSPA+), all in a single model. iPad mini with Retina display now has a next-generation FaceTime HD camera with improved backside illumination sensors featuring larger pixels for better low-light performance. The iSight camera with a 5-megapixel sensor and advanced optics, combined with iOS 7 and the image signal processing of A7, further improves still image and video capture on iPad bringing faster auto-focus, up to three times video zoom, five times still zoom, better dynamic range and automatic image and video stabilization. The new model comes in silver and white, and space grey and black, and is available for $399 for the entry-level 16-gigabyte model. It's set to launch later in November. The first-generation iPad mini will also live on, with the 16-gigabyte model now available for $299, or $30 less than its previous price. New custom-designed polyurethane Smart Covers for the iPad mini with Retina display will be available for $39 in a range of colors, including blue, green, pink, yellow, black and (RED). iPad mini Smart Cases have been completely redesigned with aniline-dyed leather available in six colors, including beige, black, blue, brown, yellow and (RED) for a suggested retail price of $69.